Why St. Pius V School? Are you happy with your child’s school? With a long history of educating generations of families, St. Pius V School provides academic excellence with faith, values, and a commitment to peacemaking. We are located in the heart of the Pilsen community – close to UIC, the Medical District, and downtown Chicago – though our students come from neighborhoods throughout Chicago and even the suburbs! St. Pius V School serves students from Early Education (full-day pre-K) through 8th grade and offers a wide array of before and after school programs. Our students thrive in a nurturing environment while being challenged daily by our rigorous academic programming. They learn values that complement their family’s faith formation and help them become peacemakers in their community. A diverse learning atmosphere and faith-focused teaching ensure St. Pius V students have the ability to learn without distractions. 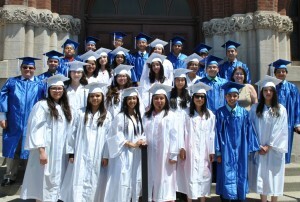 And our graduates go on to the best high schools in the Chicago area! Call (312) 226-1590 to schedule a tour and see for yourself the great things that are happening at St. Pius V School! For more information please see our school’s Facebook page. The Archdiocese of Chicago is providing six million dollars worth of scholarships to help Chicago students gain access to great Catholic schools like St. Pius V! Through the Caritas Scholarship program funded by the “To Teach Who Christ Is” campaign, St. Pius V can now offer a limited number of reduced tuition scholarships for students who transfer from public schools. Qualifying students may receive a scholarship that will pay for up to 50% of their tuition for three years. Only a few of these scholarships are still available, so please contact the school today to request more information. You may call the school office at (312) 226-1590 or visit www.saintpiusv.org to fill out an interest form. Don’t miss out on this incredible opportunity! Congratulations St. Pius V Class of 2014! 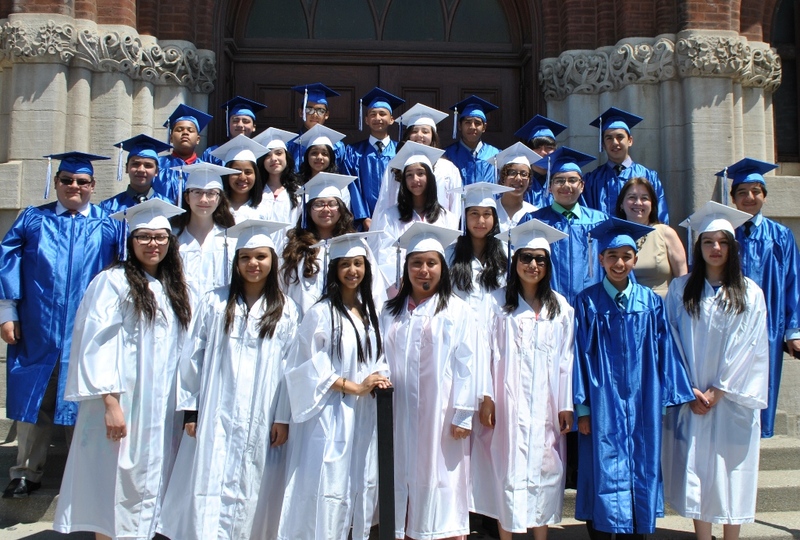 We offer our prayers for a bright future to the St. Pius V School graduating class of 2014. These students have worked hard and accomplished great things already. Soon they will begin their journeys through high school, college and beyond. The graduates will attend some of the city’s top high schools, including St. Ignatius College Prep, Whitney Young, De La Salle, Holy Trinity, UIC College Prep, and Our Lady of Tepeyac, among others. Congratulations, Class of 2014! We are proud of you. Goodbye and God bless, Ms. Lucarelli! School Enrollment Open for 2014-15! Your child or a child you know can benefit from St. Pius V School’s long, rich tradition of educational excellence and service to our community. Many of our students are children of alumni, attesting to the enduring value of a St. Pius V education. Call us today to enroll your child, and encourage families you know to consider St. Pius V as a great option for their children. Remind them that our graduates go on to attend the top high schools in the city. Please visit www.saintpiusv.org to complete an interest form or call (312) 226-1590 to request a tour. Noche Mexicana: What a Fiesta! Thank you to all of the sponsors, donors, friends, and volunteers who helped make our 8th annual Noche Mexicana a huge success! We had a fantastic time raising funds for student scholarships and celebrating Ms. Abby Torres and Mrs. Nancy Nasko, both of whom recently won prestigious awards. Your generosity means more students can study at St. Pius V and benefit from a safe, excellent education. Thanks for funding the dreams of the next generation of parish leaders! Missed the opportunity? Call 312.226-1590 to learn how you can make a world of difference by supporting the St. Pius V School scholarship fund. A race, a nation, a people….We are a community; we are Church. Peter goes on to say, Like living stones, let yourselves be built into a spiritual house…We are as living stones, chosen and fashioned by the builder, united together to form a single, beautiful edifice built upon the cornerstone which is Christ Jesus. It is not sufficient to pray and read the Bible in private. We are a royal priesthood. We are called to celebrate together in community, in our own parish, the Eucharist and the other Sacraments, to hear and reflect on the Word of God. This year at Noche Mexicana we will celebrate the successes of two of the schools greatest assets: our principal, Nancy Nasko, and our administrative assistant, Abby Torres. Both received major awards this year recognizing their contributions to SPV School. Abby received the Distinguished Service Award from the Archdiocese of Chicago’s Office of Catholic Schools. Abby is one of the reasons everything runs so smoothly in the school office. She does her job with grace, calm, and a wonderful sense of humor. 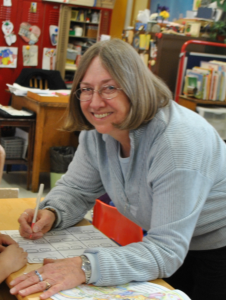 At Noche Mexicana, Mrs. Nasko will also be honored for receiving the Distinguished Principal Award from the National Association of Elementary School Principals last fall. Congratulations to Nancy and Abby!